(1) Uddhava said: 'When the Lord thereafter came to the city of Mathurâ, He, who wished the wellbeing of His parents [freeing them from imprisonment], together with Baladeva dragged the leader of public hostility [Kamsa] down from the throne and killed him by pulling him to the ground with force. (2) He mastered every detail of the Vedas and their subsidiary sciences after hearing them only once from His teacher Sândîpani whom He rewarded the benediction of bringing back his deceased son from the inner region of the departed souls, from death [Yamaloka]. (3) Invited by the daughter of King Bhîshmaka [Rukminî] Lord Krishna stole her away as His share, exactly like Garuda did [with the nectar of the gods], and thus gave all those [princes] the go-by who according to the custom were a candidate to marry her and for that purpose had come expecting a likewise fortune. (4) In an open competition for the selection of the bridegroom for Princess Nâgnajitî He subdued seven wild bulls and won her hand, but the fools who in their disappointment nevertheless wanted her, He killed and wounded without getting hurt Himself, well equipped as He was with all weapons. (5) Only because of the fact that He, just like an ordinary living being, tried to please His dear wife who wanted Him to bring the Pârijâta flower shrub [from heaven], Indra the King of Heaven, henpecked of course by his own wives, blind of anger with all his strength waged against Him. (6) When mother Earth saw how Narakâsura [Bhauma], her son who in the battle [against Krishna] physically dominated the sky [with missiles], was killed by His Sudars'ana Cakra [the disc weapon], she prayed to Him to return to Narakâsura's son that what had remained [of the kingdom]. Doing so He entered Narakâsura's fortress. (7) Upon seeing the Lord, the Friend of the Distressed, all the princesses there who were kidnapped by the demon immediately stood prepared joyfully to accept Him, with eager glances shyly closing Him in their hearts, [as their husband]. (8) Although they resided in different apartments, He, in proper regulation, through His internal potency accepted the hands of all women simultaneously with an equal number of suitable forms. (9) Desiring to expand Himself, He with each and every one of them begot ten children who all were like Him in every respect. (10) When Kâlayavana, the king of Magadha [Jarâsandha], King S'âlva and others with their soldiers had surrounded Mathurâ, He killed them by exhibiting His divine power in the form of the prowess of His men. (11) Of S'ambara, Dvivida, Bâna, Mura, Balvala and others like Dantavakra and more of them, He killed some, while others He caused to be killed [by Balarâma e.g.]. (12) Thereafter in the battle of Kurukshetra of both the parties of the nephews the kings were killed who with the force of their attacks shook the earth. (13) He was not happy to witness how because of the ill advice of Karna, Duhs'âsana and Saubala, Duryodhana with all his power had lost his fortune and lifespan and now, along with his followers, lay down [on the battlefield] with broken limbs. (14) 'What is this? ', the Lord said when with the help of Bhîshma and Drona [on the one hand] and Arjuna and Bhîma [on the other hand] the enormous burden of the earth of eighteen akshauhinîs [an army consisting of ten anikinis, or 21.870 elephants, 21.870 chariots, 65.610 horses, and 109.350 foot soldiers] had been removed. 'There is still the unbearable burden of the great strength of My descendants, the Yadu dynasty. (15) Upon My disappearance, they will vanish themselves when, intoxicated from drinking [honey-liquor], a quarrel will take place among them that will turn their eyes red as copper. This is the only way for them to disappear.' (16) With this in mind the Supreme Lord installed Yudhishthhira on the throne, thereby gladdening His friends in showing the path of the saints. (17) The descendant of Pûru [Parîkchit] by the hero Abhimanyu begotten in the womb of Uttarâ, surely would have been burned by the weapon of the son of Drona if the Supreme Lord had not averted it by protecting him again and again [see S.B. 1: 7 & 8]. (18) The Almighty One induced the son of Dharma [Yudhishthhira] also to perform three horse sacrifices and in that endeavor being assisted by his brothers, he protected and enjoyed the earth as a constant follower of Krishna. (19) The Supreme Lord and Supersoul of the Universe customarily following the path of the Vedic principles, enjoyed the lusts of life in the city of Dvârakâ without getting attached. He accomplished this by keeping to the analytical system of yoga [Sânkhya]. (20) Gentle and with His sweet glances and words that compared to nectar, He, with His flawless character, resided there in His transcendental body, the residence of the goddess of fortune. (21) He, specifically pleasing the Yadus, enjoyed this earth and certainly also the other worlds, while He, at leisure during the night, was of friendship with the women in conjugal love. (22) Thus He for many, many years enjoyed a household life of [sensual] uniting that constituted the basis of His detachment. (23) The living being is controlled by fate and so too his sensual enjoyment is controlled thus, but which person of service unto the Lord of Yoga would put faith therein? Third revised edition, loaded Oktober 27, 2010. Uddhava said: 'When the Lord thereafter came to the city of Mathurâ, He, who wished the wellbeing of His parents [freeing them from imprisonment], together with Baladeva dragged the leader of public hostility [Kamsa] down from the throne and killed him by pulling him to the ground with force. He mastered every detail of the Vedas and their subsidiary sciences after hearing them only once from His teacher Sândîpani whom He rewarded the benediction of bringing back his deceased son from the inner region of the departed souls, from death [Yamaloka]. Invited by the daughter of King Bhîshmaka [Rukminî] Lord Krishna stole her away as His share, exactly like Garuda did [with the nectar of the gods], and thus gave all those [princes] the go-by who according to the custom were a candidate to marry her and for that purpose had come expecting a likewise fortune. In an open competition for the selection of the bridegroom for Princess Nâgnajitî He subdued seven wild bulls and won her hand, but the fools who in their disappointment nevertheless wanted her, He killed and wounded without getting hurt Himself, well equipped as He was with all weapons. Only because of the fact that He, just like an ordinary living being, tried to please His dear wife who wanted Him to bring the Pârijâta flower shrub [from heaven], Indra the King of Heaven, henpecked of course by his own wives, blind of anger with all his strength waged against Him. When mother Earth saw how Narakâsura [Bhauma], her son who in the battle [against Krishna] physically dominated the sky [with missiles], was killed by His Sudars'ana Cakra [the disc weapon], she prayed to Him to return to Narakâsura's son that what had remained [of the kingdom]. Doing so He entered Narakâsura's fortress. Upon seeing the Lord, the Friend of the Distressed, all the princesses there who were kidnapped by the demon immediately stood prepared joyfully to accept Him, with eager glances shyly closing Him in their hearts, [as their husband]. Although they resided in different apartments, He, in proper regulation, through His internal potency accepted the hands of all women simultaneously with an equal number of suitable forms. Desiring to expand Himself, He with each and every one of them begot ten children who all were like Him in every respect. When Kâlayavana, the king of Magadha [Jarâsandha], King S'âlva and others with their soldiers had surrounded Mathurâ, He killed them by exhibiting His divine power in the form of the prowess of His men. Of S'ambara, Dvivida, Bâna, Mura, Balvala and others like Dantavakra and more of them, He killed some, while others He caused to be killed [by Balarâma e.g.]. Thereafter in the battle of Kurukshetra of both the parties of the nephews the kings were killed who with the force of their attacks shook the earth. He was not happy to witness how because of the ill advice of Karna, Duhs'âsana and Saubala, Duryodhana with all his power had lost his fortune and lifespan and now, along with his followers, lay down [on the battlefield] with broken limbs. 'What is this? ', the Lord said when with the help of Bhîshma and Drona [on the one hand] and Arjuna and Bhîma [on the other hand] the enormous burden of the earth of eighteen akshauhinîs [an army consisting of ten anikinis, or 21.870 elephants, 21.870 chariots, 65.610 horses, and 109.350 foot soldiers] had been removed. 'There is still the unbearable burden of the great strength of My descendants, the Yadu dynasty. With this in mind the Supreme Lord installed Yudhishthhira on the throne, thereby gladdening His friends in showing the path of the saints. The descendant of Pûru [Parîkchit] by the hero Abhimanyu begotten in the womb of Uttarâ, surely would have been burned by the weapon of the son of Drona if the Supreme Lord had not averted it by protecting him again and again [see S.B. 1: 7 & 8]. The Almighty One induced the son of Dharma [Yudhishthhira] also to perform three horse sacrifices and in that endeavor being assisted by his brothers, he protected and enjoyed the earth as a constant follower of Krishna. The Supreme Lord and Supersoul of the Universe customarily following the path of the Vedic principles, enjoyed the lusts of life in the city of Dvârakâ without getting attached. He accomplished this by keeping to the analytical system of yoga [Sânkhya]. Gentle and with His sweet glances and words that compared to nectar, He, with His flawless character, resided there in His transcendental body, the residence of the goddess of fortune. He, specifically pleasing the Yadus, enjoyed this earth and certainly also the other worlds, while He, at leisure during the night, was of friendship with the women in conjugal love. Thus He for many, many years enjoyed a household life of [sensual] uniting that constituted the basis of His detachment. The living being is controlled by fate and so too his sensual enjoyment is controlled thus, but which person of service unto the Lord of Yoga would put faith therein? In the city of Dvârakâ the princely descendants of Yadu and Bhoja some day had been playing a prank on the sages and thus had angered them. They thereupon cursed them, knowing what was desired by the Supreme Lord. A few months later the descendants of Vrishni, Bhoja and others like the sons of Andhaka, bewildered by Krishna, with great pleasure on their chariots went to the place of pilgrimage called Prabhâsa. There they took a bath and with that same water proved their respects to their forefathers, the gods and the great sages. Then they gave cows to the brahmins in royal charity. For their livelihood they also provided them with gold, gold coins, bedding, clothing, seat covers, blankets, horses, chariots, elephants, girls and land. 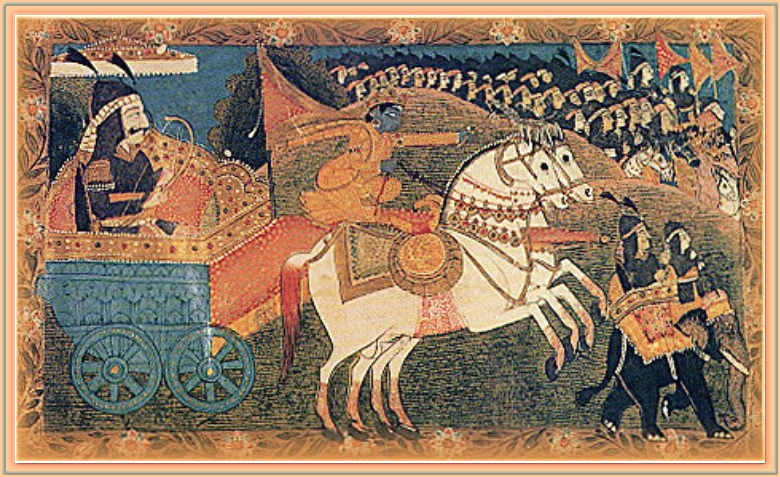 The picture shows Krishna and Arjuna engaging in the battle at Kurukshetra. Source.